Women's winner of the 2018 Soweto Marathon (and mom) Irvette van Zyl's advice for running during pregnancy – and after. 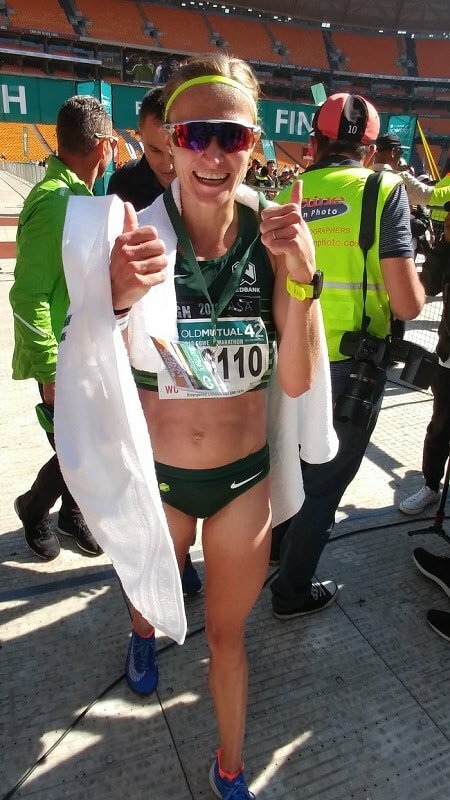 Last June, South African long-distance runner Irvette van Zyl welcomed her second child, a healthy son called Gideon, into the world. The highlights of her first few months of motherhood have been to hold a smiling, giggling, sweet little boy in her arms, and to watch him grow. During her pregnancy, Van Zyl maintained a healthy weight. The 31-year-old from Johannesburg carried on running throughout her pregnancy – she even managed a 46-minute 10-K four days before Gideon was born! It’s been a matter of months since she gave birth, and already she’s returned to running at elite level. Here, Van Zyl shares her sage advice for expectant moms who still want to run, and who need to find the balance between training and family life. Go with the flow, as opposed to planning ahead. Base your training on how you feel on the day, and only do what your body is capable of. Running should make you feel better, not worse. My second pregnancy started out differently, because at first I didn’t know I was pregnant. Unknowingly, I raced the SPAR Women’s Race in Johannesburg, and the Soweto Marathon. This meant my fitness level was high, and I found it easier to run further than I had during my first pregnancy. But 12 weeks into my pregnancy, my ligaments couldn’t handle the same level of training. I swopped afternoon gym workouts for low-impact swimming; and instead of running twice a day, I only ran once, usually in the morning. I also stopped running at the track, because I struggled to breathe during harder sessions. 9 days Postpartum working on getting my running body back by eating healthy and working on the sleep that is now not on the priority list with our Newborn. Getting excited to start running again. You shouldn’t feel exhausted after a run. During both of my pregnancies I ran twice a day, did light training at the track, and went to the gym. I scaled down every run to adjust to the trimester I was in, and my doctor advised me when I should train less and rest more. After 20 weeks, I couldn’t do runs longer than 20km; and by 30 weeks, I was down to 30 minutes of running, and no gym or track workouts at all. Every individual is different; and if my experience is anything to go by, every pregnancy can also be different. Run during pregnancy only if that’s what you’ve been doing already. There’s no secret to my return to running at elite level, except for hard work and cutting out sugar for the first two months. During my pregnancy, I ate vegetables and meat, and cut down a little on carbohydrates. But when I increased my training load post-pregnancy, I needed more energy, and had to increase my carbohydrate intake. No matter what you do during pregnancy, your body becomes soft, and you lose muscle tone. Post-pregnancy, strength and conditioning in the gym helped me to get firm again. It pays to listen to your body post-pregnancy too. Remember: it took nine months to create a human being. Be patient, and don’t go out too fast, too soon. I would’ve liked to have had more time to prepare for the Soweto Marathon, but I saw it as a great opportunity to see where my strengths lie, and which weaknesses I need to work on for the 2019 season. In addition, I wanted to defend my title on this challenging course. In the end, I started the 2018 Soweto Marathon believing I was in better shape than I had been at the race in 2017, and I was excited about running it because I love the atmosphere. 4am: Get up. Check on Gideon. Have coffee and oats. 7am: My husband, LJ, has dressed the kids, changed their nappies and re-filled their milk bottles. 7:30am: LJ and I drink coffee and chat about how our schedules look for the day. 8am: LJ takes Louis, our eldest son, to the crèche. I feed Gideon and give him milk. 8:30am: Clean the house. Do the laundry. 10am: More coffee. Go to the gym. Drop Gideon off at Virgin Active’s Club V while I train. 12:30pm: Return home. Make lunch and catch up with admin. 1:30pm: Give Gideon lunch and milk. 3pm: Pick up Louis and do food shopping. 4pm: LJ arrives home from work. I go for my second run. 7pm: Gideon goes to bed. Play with Louis. 8pm: Louis goes to bed. LJ and I drink tea, catch up and watch TV. 9pm: LJ and I go to bed.